I have been busy, busy, busy with pattern testing this last month and it is SO much fun! There’s the Thumbs Up Tee for women from OUSM that I have yet to post about, the Spruce Shorts by Zuzzy that will be up next, a top secret women’s pattern destined for the PDF pattern bundle releasing in May, a vintage-looking Kimono style dress from a new Danish designer set to release in July, and these shorts, the Koda Bek by Koda Baby. I can’t say enough good things about them, so let’s start with the basics. 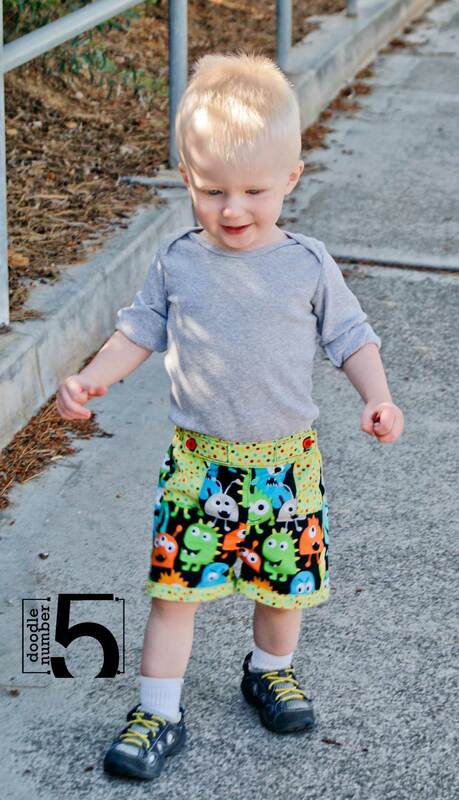 Koda Baby is a new-ish pattern designer based out of Australia. I first heard about her about 9 months ago when she released an adorable ruffle-bustle skirt for girls. I don’t have any little girls to sew for, and I bought the pattern anyway- it is THAT cute, and the reviews were so positive. When I saw the tester call come out for these shorts, I jumped right in. 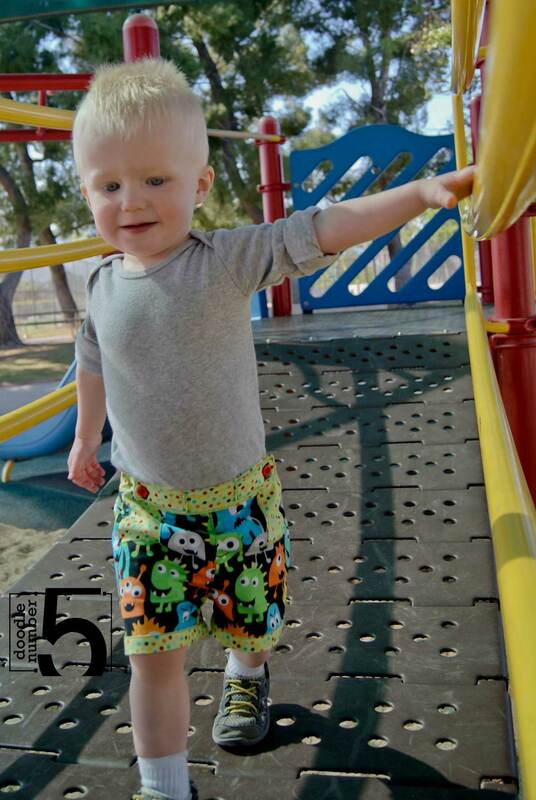 These shorts go from size 3 months – 8 years and include 2 different cuff options. They feature a flat front, open-front pockets, a front tab/flap closure that can be operational or decorative, 1″ elastic back waistband, and contrasting cuffs. The style allows ample opportunity to show off all your fabric coordinates too, between the waistband, pockets, tabs, and cuffs. They are definitely gender neutral, which is an added bonus. Get the pattern from her Etsy Shop with a 20% off coupon code BekBermudas good through 12Apr2015. Also, think about joining the Facebook group, Koda Baby Boutique to meet the designer, ask questions, and get inspired. With all the details, they weren’t my quickest sew ever, taking about 3-4 hours from start to finish. But the instructions are very well written and easy to follow. 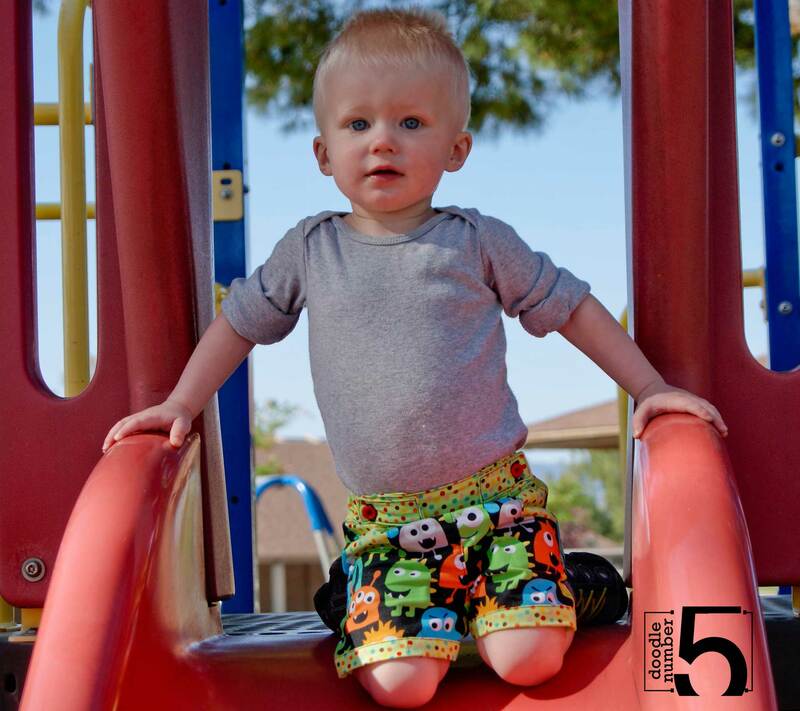 An adventurous beginning sewist can certainly complete these shorts with no problems. 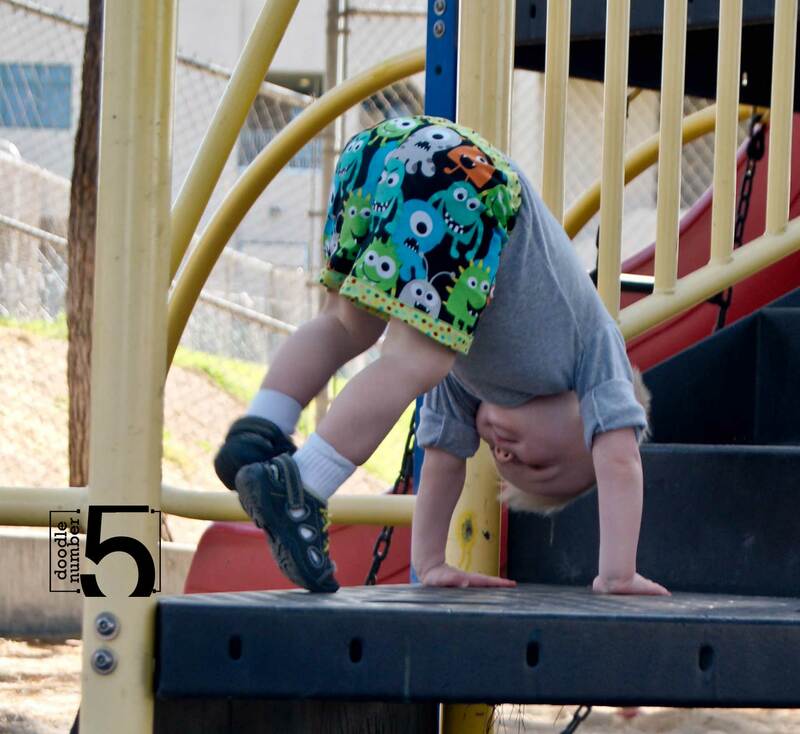 The most important thing, however, is how much my son loves these shorts! We took them for a walk and they totally passed the Playground Test – the 1″ elastic in the back stays put, no matter what Lil Fox put them through. These are the 18m/1 size and I found them perfectly sized based on the measurements provided in the pattern. – When you buy, you get two PDF files to download – one is the pattern, one is the instructions. You can print just the pattern, then load the instructions onto your tablet or computer and follow along from there. – The pattern has clear markings to guide you in assembling the pieces so that ultimately it will look very similar to the paper patterns you are used to buying. This pattern was only 6 pages, and includes layers so you can print only the size you need. – The benefit of this is that you get endless use out of your patterns- you can make it as many times in as many different sizes as you need, and your pattern will never wear out. – Also, I’m not affiliated with the designer in any way, other than having tested this pattern. I won’t receive any compensation if you choose to purchase. Though, clearly, I totally recommend that you do!